Audi finally introduced its S-variant by unveiling the new Audi S3 Sedan 2015 at the New York Auto Show. It is after a long time that company has released a model to fill its sports sedan segment and this is one of the reasons why there are so many eyes glued to this release with very high expectations. 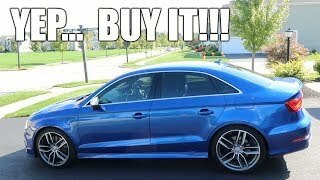 Let us have a quick descriptive look at the review of Audi S3 Sedan 2015 and excavate out a conclusion; if the expectation will be fulfilled or not? Interior of Audi S3 Sedan 2015 is decent and clean with its looks. A multi function three-spoke flat bottom steering wheel sits in front of ultra comfortable seats. Behind the steering wheel are the instruments featuring gray dials. Through out the interior you can notice trim strips incorporated with black 3D look. Center of the dashboard has a display screen with turbine like air vents beneath it. The sports set so offered with Audi S3 Sedan can be upgraded by the S-line performance set. In all to us the cleaner interior of Audi S3 Sedan looked much better to us when compared to its siblings. 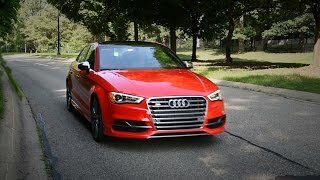 Exterior of Audi S3 Sedan 2015 might not surprise you but will definitely interest you. Housed with modified bumpers at both front and rear add to the sporty touch of car. New improved single frame grille is mounted on nose with twin-razor blades, one resembling to Gillette razor, the same is adored with the traditional art, Audi logo. Along the side apart from the muscular lines you have new side sills with new side sills. Beneath the grille are new piece of air intakes while just above the side sills are the exterior mirror housings that look really attractive enough to grab the second attention. At the rear end another major and sporty integration is with the spoiler. 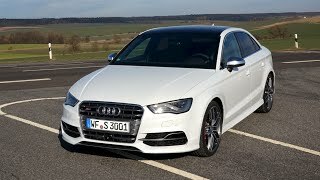 Audi S3 Sedan 2015 is powered by a 2.0 Liter TFSI engine generating total output of 292 hp and peak torque of 380 nm. With its power rolling the 19” alloy wheels it can reach 62mph from standstill in just 4.9 seconds, when paired to S tronic automatic transmission. 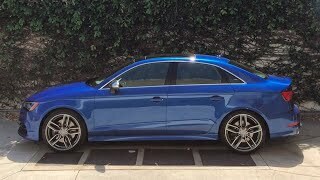 However in case of manual it takes 5.3 seconds to achieve the same target with top speed of Audi S3 Sedan 2015 being same at 155 mph, which is electronically limited.